HAVING often passed by little-known Dholpur midway between Agra and Gwalior, I decided to visit this place. One of the tourism booklets of Rajasthan Tourism Development Corporation, Delightful Destinations covers Alwar, Sariska, Bharatpur, Deeg and Dholpur. Having seen the other destinations, I decided to visit Dholpur. We set off on a bright sunny morning from New Delhi. Driving through crowded Faridabad, we are soon on a wide metalled road. At Hodal (90 km from Delhi), we briefly halt at Haryana Tourism motel Dabchick for coffee and move ahead. Having missed a direction board for a bypass to Dholpur, we drive past Agra and are on way to Etawah when we realise we are on the wrong track. We have to go back about 18 km to Agra and after winding our way through the city we hit the road to Dholpur. An hour later we are in Dholpur city, having driven past the Rajasthan Tourism Development Corporation (RTDC) motel right on the highway, a few minutes earlier. From Delhi to Dholpur, we had covered 240 km. The first spot to be visited on our itinerary is the Van Vihar, a good 19 km uphill drive from Dholpur. Driving past the Sainik School, the buildings of which have been donated by the royal family of Dholpur, we enter the wildlife sanctuary through a dilapidated gate. The road is full of potholes and we drive in low gear. A lone watchman at the old Forest Rest House informs us that the royalty often used to visit the spot in the past. However, family feuds in recent years have kept them away from the place. 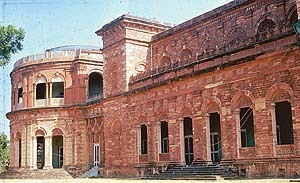 The rest house was constructed by the rulers of Dholpur, who subsequently handed it over to the Forest Department. The serenity here is, indeed, inviting. We spend some time clicking photographs from the other side of a lake adjoining the building. Covering an area of about 60 sq. 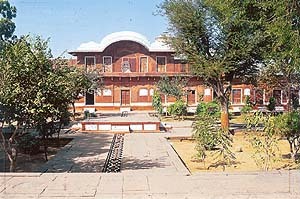 km, the Van Vihar was notified as a wildlife sanctuary by the Rajasthan Government way back in 1955. The sanctuary serves as the abode for sambhars, wild bears, hyenas, leopards, chitals and blue bulls. Not far from Van Vihar is the Ram Sagar wildlife sanctuary. It is so named because of the Ramsagar lake which is believed to be inhabited by crocodiles and a variety of species of fishes and snakes. We skip the place as we were running short of time. Time permitting, one should visit the sanctuary to have a glimpse of the migratory ducks and geese and other water birds like gray and purple herons, ringed plovers, ibis, white-breasted water hens, cormorants and darters. Next on our itinerary is the Talab Shahi as the road from the Van Vihar leads straight to that place. The 13 km stretch is dotted with villages, one of which had all walls painted in blue reminding use of the pink buildings of Jaipur. We cover the last 5 km in less than five minutes, what with the well-maintained metalled road as if to herald the approach to a royal abode. 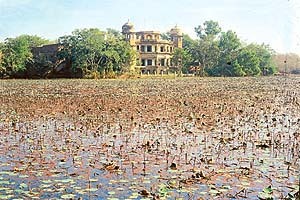 The Talab Shahi, so known because of the palace built alongside the lake, attracts a large number of migratory birds like pintail, common teal, shoveler, tufted duck, gadwall and red-crested pochard. We drive around the palace to enter from the gate facing the lake. Confronted by a constable of the 6th Battalion of Rajasthan Armed Constabulary, we reveal our identity and the purpose of our visit. The policemen’s presence deters villagers from encroaching into the palace and marring the beauty of the majestic building. They are, indeed, doing a good deed by helping the government preserve this palace built by Shahjahan in 1617 as a hunting lodge. Driving back to Dholpur, we reach the town after covering 29 km and head for the Dholpur palace in the heart of the town. The palace is closed and we go around taking photographs. The Maharani of Dholpur, we are told, comes to the town now and then . A word about the history of Dholpur. Named as Dhawalpuri after Dhawal Deo, once the ruler of the city, its name came to be distorted with passage of time and got its present name Dholpur. Ruled by a Chauhan family in 846 A.D., Dholpur has had a very turbulent history because of its strategic location. Though the rulers of Dholpur fought bravely and put up stiff resistance against the invading forces, they were, on occasions, forced to eat humble pie. Sikander Lodi’s invasion in 1501 was followed by another attack by Babar in 1526. 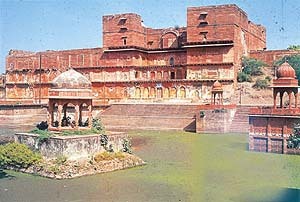 The town was later shifted to the north during Humayun’s rule to avoid erosion by river Chambal flowing alongside. And now to return to our trip, from the palace precincts, we head for Muchkund, an ancient sacred place. On the way, we briefly halt at the clock tower, the municipal corporation building and the library. We come across men with ferocious mustaches and guns slung across their shoulders. Tyagi explains that these are all dacoits who surrendered. Even sarpanches move about with guns for their own security. A large tank encircled by a temple all around gives a picturesque view of Muchkund, so named after Raja Muchkund, the 24th king of the Suryavanshi clan. Legend has it that Raja Muchkund while asleep at this spot was rudely woken up by Kaal Yaman who was pursuing Lord Krishna. Blessed as Raja Muchkand was with supernatural powers, the moment he woke up, Kaal Yaman was reduced to ashes. 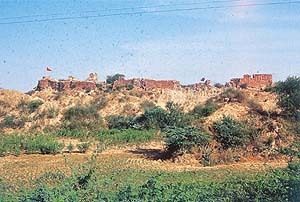 On my enquiry about the Sherghar Fort, which I had learnt was close to the highway to Chambal, we are advised to avoid it. The aura of mystery around this fort arouses my curiosity but on the advise of my wife, we decide to skip it. On way to Chambal, just a few kilometres from Dholpur, we spot the fort in ruins amidst the ravines. A red flag fluttering atop the fort spells something ominous and we drive past after briefly halting and taking a few shots of the decrepit fort. A unique feature of Dholpur is that even though this town is in Rajasthan, it is surrounded by the Chambal ravines of Madhya Pradesh on the south and east while to the north and west it is encircled by Agra.